Hailing from North America this hard rock band released its self titled CD in early 2005 which received critical acclaim as well as airplay in the US, Australia, and Europe for having strong classic rock roots with a modern edge sound all its own. 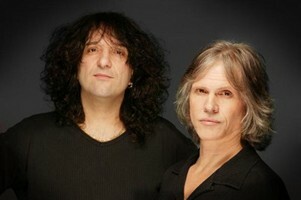 The groups main writers Phil Naro (Talas, Peter Criss & 24K) and Don Mancuso (The Lou Gramm Band, Black Sheep, Cheater, and Celtic Fire) and Andy Knoll (The Lou Gramm Band) decided to team up for the D DRIVE album and recruited the production expertise of Canadian monster Steve Major to round out the direction andproduction. The DDRIVE CD did so well that it was decided to put together the a second release from titled “Straight Up The Middle” Built on the strengths of the first CD. “Straight Up The Middle” was more focused and mature effort and is right in line with infectious grooves, emotion and the good and bad realities of the world today. DDrive “Straight Up The Middle” line up was Phil Naro (Vocals/Guitar), Don Mancuso (Guitar/Vocals), Andy Knoll (Keyboards, Guitars, sequencing & samples/ Vocals), Bobby Bond (Drums) and John Taylor (Bass/Vocals). Other musicians that appeared on “Straight Up The Middle” Joe Lana (Drums), Richard Gramm (Bass/Guitar), Lou Gramm (Backing Vocals) AD Zimmer and Dave Quick (Bass) and Steve Major (Guitar) “Straight Up The Middle” also received great reviews and proved to be another memorable effort! 3D promises to be a worthy follow up “Straight Up The Middle” as the band has become even tighter over the years. 3D has great significance as well, not only as their 3rd release but the CD will be housed in a special 3D cover with 11 new rocking tracks. Track Listing: Next Train, Dig Down, Kiss the Ground, Chains On You, Never Had A Chance, Last To Fall, Down Deep, Always Done, 1 To 7, Tumblin, Welcome To My World.